Tips – VMware, Microsoft and General IT tips and definitions, What is this?, How this works? Backup – Virtualization Backup Solutions, VMware vSphere Backup and ESXi backup solutions. 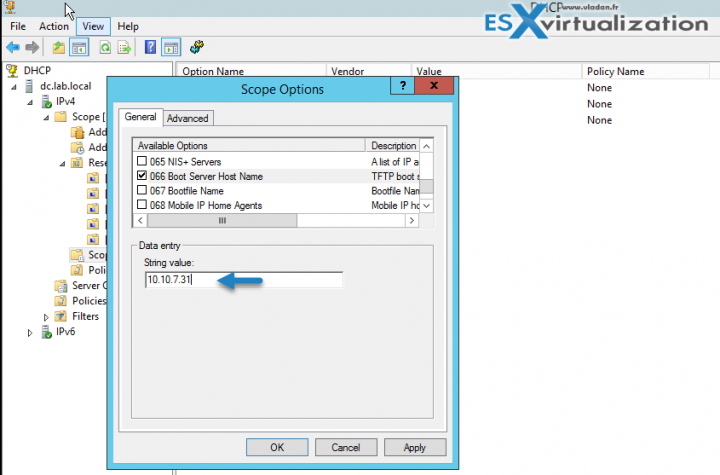 How To – ESXi Tutorials, IT and virtualization tutorials, VMware ESXi 4.x, ESXi 5.x and VMware vSphere. VMware Workstation and other IT tutorials. Free Stuff – Free virtualization utilities, ESXi Free, Monitoring and free backup utilities for ESXi and Hyper-V. Free IT tools. Videos – VMware Virtualization Videos, VMware ESXi Videos, ESXi 4.x, ESXi 5.x tips and videos. Reviews – Virtualization Software and reviews, Disaster and backup recovery software reviews. Virtual infrastructure monitoring software review. We have started our Autodeploy posts in a wrong order. (kind of). Basically, we already explained the initial setup of Autodeploy within vSphere (starting services, initial config) Image Builder management (preparation, image cloning, and management of images). We have also written a post about Autodeploy rules which allows you to create and edit rules (within GUI) which then tell how the stateless host will behave upon booting. Today, however, we have to go back and prepare the DHCP Server for vSphere Auto Deploy Provisioning. Auto Deploy uses a PXE boot where you have to enter some specific DHCP scope options. We’ll see the details today. vSphere Autodeploy needs also TFTP server, but VCSA 6.5 has already one. A Service just needs to be started. Here you can see an overview what’s already “baked in” within the VCSA 6.5 which I migrated to. Not only there is vsphere Update manager, but also the Autodeploy TFTP server. I’ll be demoing it via Windows DHCP and I have one DC which runs the DNS service for my lab. So without further wait, let’s get started. Connect to your DHCP server and create a DHCP scope for the IP address range which fits your needs. In my environment, I’ll go with the 10.10.7.x network and I’ll be booting a “nested ESXi”. But those could be perfectly fine physical hosts if I had a spare one… -:). So just go to Administrative Tools and click DHCP > Navigate to DHCP > Hostname > IPv4 > Right-click IPv4 and select New Scope. Specify some meaningful name and description for the scope. Continue to the next page where you’ll chose an IP address range. Continue with the Exclusion and delay screen by not changing anything > Next > Lease duration (leave default) > Click Next until you reach the Configure DHCP Options screen and select No, I will configure this option later. Step 2 – Create a new reservation. What we need to do next is to create and configure a DHCP reservation for each ESXi host that we’ll bee booting. Go to DHCP > hostname > IPv4 > Autodeploy Scope > Reservations. Do a right click > New Reservation. While there, put some meaningful name, IP address, and the MAC address for one of the hosts you’re booting. TIP: Do not include the colon (:) in the MAC address. So you should look like this. Rinse and repeat for each of the other hosts you wish to use. I stick with only one ESXi for now, but will add more later. Next, we need to set up the DHCP Server to point the hosts to the TFTP Server. As the TFTP server is already up and running, we don’t have to install it. Remember, in vSphere 6.0 it was an additional process where we had to install a small free TFTP server from Solarwinds. In the Scope Options window, click the General tab. Click 066 Boot Server Host Name and enter the address of the TFTP server. Then configure another option, the one with number 067. Click apply, OK to close the window. So this is just a close up image from vCenter server settings (the same as the first image in this post). You can see it when you connect via vSphere client and go to Home > Hosts and Clusters > and Select at the very top the vCenter server > Configure TAB > Autodeploy. 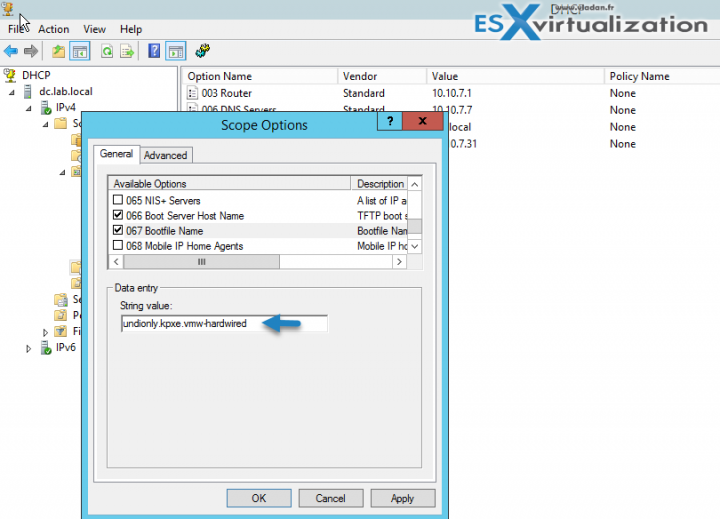 The undionly.kpxe.vmw-hardwired iPXE binary will be used to boot the ESXi hosts. 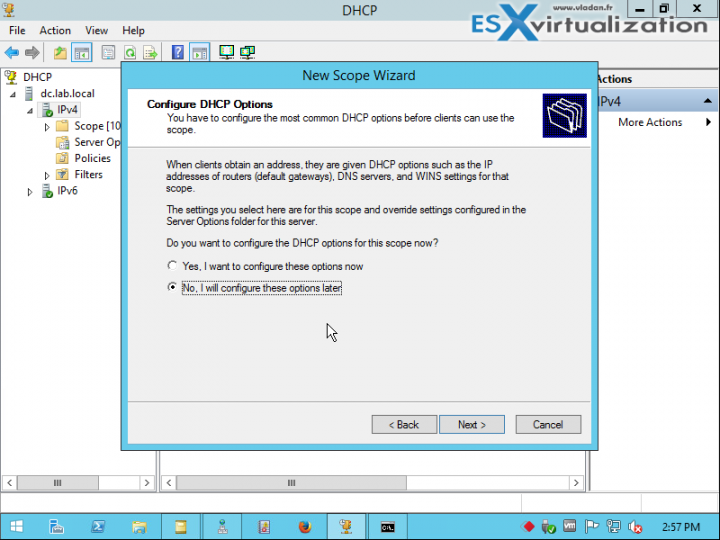 In the DHCP window, right-click DHCP > hostname > IPv4 > Scope > Activate. You should not log out from the DHCP Server if you are using Active Directory for DHCP and DNS, or log out otherwise. And this is the rule activated. and we will see the stateless ESXi host finally booting up…. VMware vSphere 6.5 and New Image Builder GUI – Cloning a profile – New!! VMware vSphere 6.5 AutoDeploy Rules – New!! If you want the latest How-to, news, videos ant tutorials for vSphere 6.5, just check the dedicated vSphere 6.5 page. VMware vSphere 6.5 Configuration Maximums – New!! This website is maintained by Vladan SEGET. Vladan is as an Independent consultant, professional blogger, vExpert x11, Veeam Vanguard x5, VCAP-DCA/DCD, VCP, ESX Virtualization site has started as a simple bookmarking site, but quickly found a large following of readers and subscribers. Visiting Indian Ocean and Reunion Island? Connect on: Facebook. Feel free to network via Twitter @vladan. For non-Windows users ‘dnsmasq’ is a DNS,DHCP and TFTP server that will satisfy the Auto Deploy requirements. Thanks for your input on this. That worked, so manual steps work but automated steps (via hardwared) did not? So I replaced the undionly.kpe.vmw-hardwired file that came with 6.5 with a copy of the 6.0 version of the same file… and bingo, things worked. So I wonder what VMware did not regression test? Something in the 6.5 version of the undionly.kpe.vmw_hardwired file is broken at least when trying to deploy ESXi 6.5 to VMs. 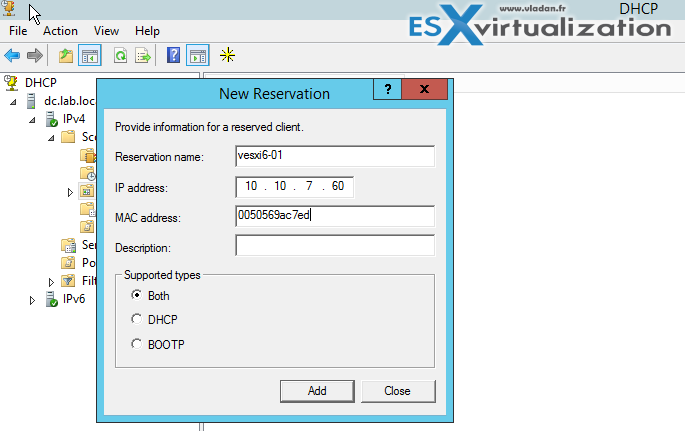 The 6.5 VM was created with all defaults, only changes where to enable VT-X in VM. Anyone else see this issue? That’s definitely an odd issue. Thanks for the feedback. Hope someone will find out why this is happening…. 2. I want to try using undionly.kpe.vmw-hardwired file of vCSA 6.0 ..from where can i download his file ? FREE Forever—Back up VMware with Altaro VM Backup. Grab your Free copy now! vSphere Hypervisor Per Incident Support Click Here. Altaro VM Backup – Protect your VMware and Hyper-V VMs for Free with Altaro VM Backup. 2 VM for Free, forever. Grab your copy now! Veeam ONE Community (FREE) Edition 9.5 U4 – Download Now. monitor up to 10 instances of VMware, Hyper-V, Veeam Backup & Replication and Windows and Linux workloads! Veeam Backup And Replication Community (FREE) Edition 9.5 U4a – protects up to 10 instances (VMs or Computers, laptops for Free. Veeam Backup & Replication 9.5 U4a Full Version Download (30 Days Trial – Get Your Copy !